There’s a reason the most sophisticated fashionistas, past and present, are given the coveted title of “icon.” Our fascination and admiration of their good style is simply that powerful. For those who try to emulate these icons, dressing can become something of an art. All of the basic elements of good design—like balance, color, shape and texture—are used to craft the perfect ensemble. Even if you don’t fancy yourself a style maven, chances are you still have to spend a fair amount of time putting yourself together each day. But think about it: If we were to put as much effort into the design and upkeep of our closets or dressing areas as we did our outfits, life would be a whole lot prettier, not to mention more efficient. Although a woman’s closet (or style-savvy man’s, for that matter) is home to highly treasured pieces, it often gets bumped to the bottom rung of design priority. Whether you like to create it or just appreciate it, a clean, organized, attractive space is one we all gravitate toward. Sure, a closet may not be classified as a room, but if you treat it like one, getting dressed each day will feel a lot more like a treat rather than a chore. By putting effort, resources and creativity into the dressing area of your home, your style (and sanity) will thank you. Beginning a day with a clean, styled closet can be equally important, if not more so. Busy schedules often require early wake-up calls, and morning routines can feel as though they get in the way, or worse, feel like a waste of precious time. By creating a space where you can quickly and efficiently see your wardrobe options, the morning ritual of dressing can become a time for you to think about things more important than wondering where your tailored black blazer is. To create this type of space, don’t feel limited to the closet in the traditional sense, meaning that standard, good-sized space with shelves and a hanger bar or two. Whether you live in a 2,500-square-foot colonial in the suburbs or a tiny walk-up apartment in the city, dressing areas can be carved out of some of the most unlikely of spots. In the case of close quarters, the goal should be creating multifunctional storage. A storage bench at the foot of a bed could serve as a place to sit while putting on shoes, but also acts as a place to store all of your footwear, because, let’s face it, nothing seems to take up more real estate in a closet than shoes. Rather than clogging shelf space with a box of silk scarves, click a handful of shower curtain rings to an ordinary hanger and loop your scarves through. Small closets aren’t the only place to get creative with storage. Even if you have a large walk-in with plenty of room to hang your wardrobe, you may have extra wasted space. 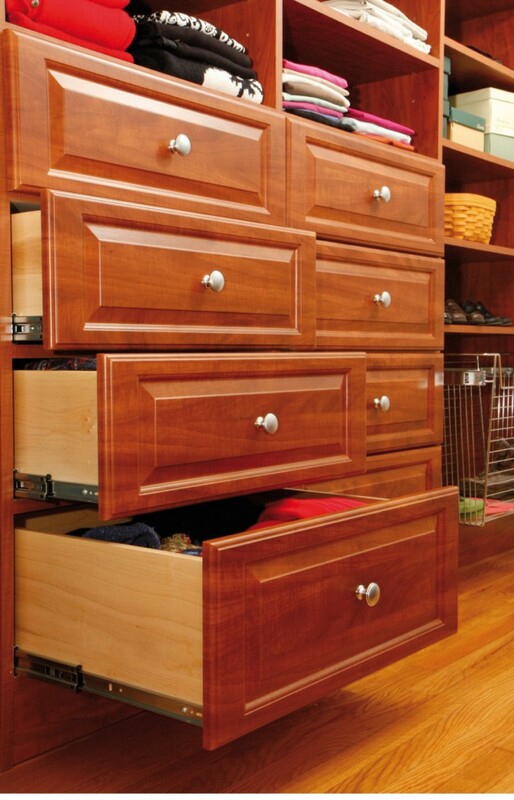 Think about incorporating drawers to hold folded T-shirts, socks and pajamas. Don’t be deterred if custom built-in units are out of your budget’s reach. Shifting a dresser in place is an easy, inexpensive solution. If you already have a dresser, slipping it into the closet is a great way to win back some room in your master. This could also be a great chance to go shopping. Whether you go vintage with a piece from a local antique store or check the inventory of a big box store, choose a piece that speaks to you. 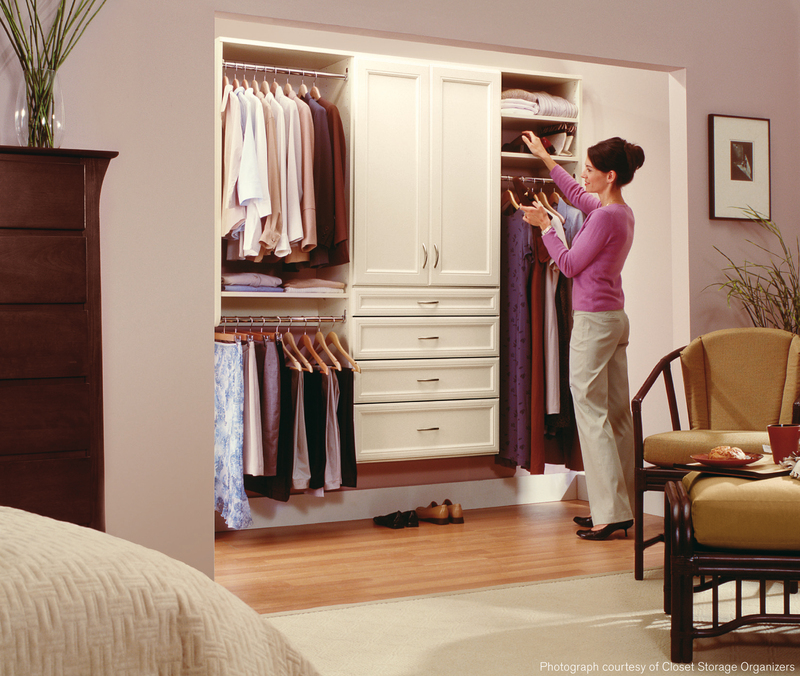 Since closets are rarely a place for guests to congregate, let your imagination run wild. If you love the look of mirrored finishes but they don’t fit into the rest of your home’s décor, this is the place to use it. Or, if you don’t often go for rustic finishes but are somehow drawn to a weathered dresser with burnished brass pulls, now’s the time to jump on it. Anything goes in this oh-so-personal space. 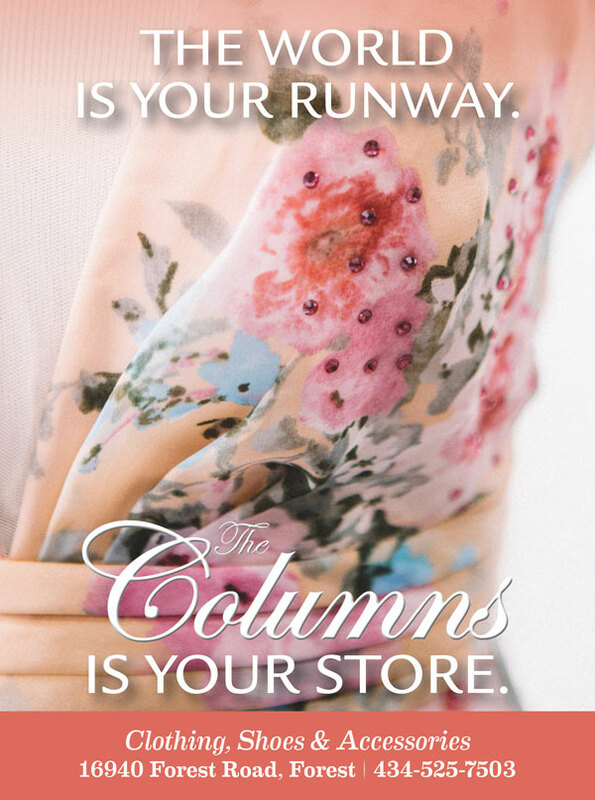 One challenge that plagues owners of closets both big and small is jewelry. It can take up space in the blink of an eye. But take a second look at that heap of earrings, necklaces, rings and bracelets. Jewelry is often beautiful, delicate and colorful, made from shimmering metals, stones or glass. What acts as art for the body can easily be art for the home if nicely displayed. Try repurposing an old frame by gluing window screening inside the opening in the middle. 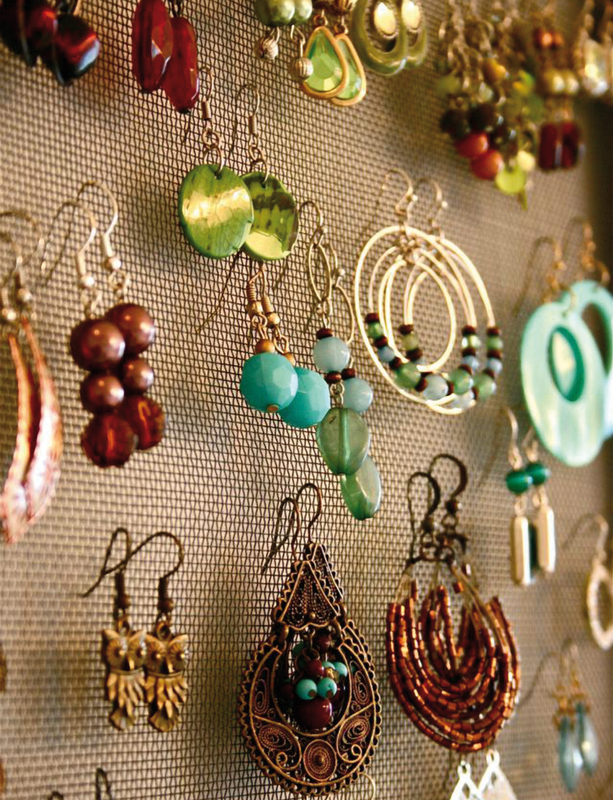 Slip the wire backs of drop earrings through the mesh and mount the frame on a bedroom or bathroom wall, or even on an interior wall of your closet. It’s a handy way to organize jewelry that doubles as unexpected sculptural artwork. Push post-style earrings into the foam backing of a shadowbox frame, which can either sit on a tabletop or be hung for artistic appeal. The ugly truth, though, is that no amount of creative storage ideas can save a wardrobe that’s exploding at the seams. Purging isn’t easy, especially if you’ve been holding on to pieces for decades, but it is an absolute must when overhauling a closet area. If you have a hard time deciding what to keep and what to toss, try this tip on for size. Turn all the hangers in your closet so that the hooks are facing outward rather than toward the wall. Then, every time you wear an item of clothing, hang it back up correctly with the hook facing back toward the wall. At the end of the season, you will be able to see at a glance what items you wore and which you didn’t by the direction of the hanger. Aside from a few special occasion pieces, those that weren’t touched in the last several months should be donated or consigned. Everyone has a crutch when it comes to wardrobe obsessions, whether it’s shoes, purses or plaid button-ups. Take control of these collections and wheedle them down to favorites only. Make it a steadfast goal to have a closet filled with pieces you love 100 percent of the time instead of just 50 percent of the time. Whether you have a single closet with one hanging bar or an entire room dedicated to your wardrobe with floor-to-ceiling shelves, spend time to make it truly yours. Start with the doors. Take down standard bifolds and replace them with frosted glass French doors. Check places like restoration warehouses or Craigslist for new-to-you doors if you are on a budget. Or nix doors entirely and hang panel draperies in an elegant pattern to suit your tastes. This will go a long way in achieving a softened look. When decorating the interior, treat your closet like you would any other room in your house. Although the traditional idea of “accessories,” like pillows and tabletop lamps, doesn’t necessarily fit inside a closet, you can still bring in fun, chic pieces to elevate the feel. Toss mismatched hangers and replace them with boutique wooden hangers. Throw down a beautiful area rug to snuggle bare feet into as you get ready in the morning. Runners are a good solution for a long thin closet. Consider hanging some art—a closet is a great spot to display whimsical prints of sketched dresses and shoes—or save this private area for favorite photographs that might not fit into the décor of the rest of the house. Lighting is one closet accessory that you can really have fun with. Replace existing overhead lights made of frosted glass (or worse, fluorescent tubing) with a chandelier or a modern drum shade fixture. That extra bit of sparkle and style could easily make you forget that it’s a closet. Also, switch out dim lights for ones that offer more brilliance. Nothing makes a windowless closet seem more like a real space than good, clean light. Now it’s time to play with color. Rather than going bold with paint, choose a basic neutral that will help bring out the best in the colorful patterns and textures of the clothing itself. Think silvery grays or soft blues, blushes and mints. Choosing a feature wall to wallpaper could also be a fun way to dress up the space. Got a “his and hers” situation? Let individual personalities shine. Even if your home doesn’t boast separate closets, you can create the illusion of division through color and shelving. Choose one color each, and purchase storage boxes and hangers in each of the two hues. This is one vivid way to guarantee that wardrobes and accessories are distinct from one another. And no dressing area is complete without a full-length mirror. Consider hanging it using hinges—on the wall of your closet, your bedroom, or even a hallway if space is at a premium. Whenever you need it, you can swing it out to get just the right angle. Steer clear of those inexpensive “college dorm” mirrors; invest in one with an interesting frame—a chunky white wooden frame for a traditional look, or a sleek-lined brass frame for a mod flair. Question your instincts on what a “closet” really is. Ditch thoughts of a dark, boring place and instead dream of color, pattern and floor-to-ceiling style rather than floor-to-ceiling clutter. A well-groomed closet means a well-groomed (and more relaxed) you.